Will work for Biltong: Of dogs and children. My daughter, who is now 23 and has grown out of it, threw food on the floor and wouldn't eat food unless the ingredients were separate. The child in all of us would love these pancakes just the way they are. The pancakes made it all right, didn't it? Hearing about your daughter's kitchen antics makes me giggle. She sounds adorable. Pancakes look divine! Thanks everybody. She is the most adorable girl in the world, blueberries on the floor and everything. And yes, pancakes does make early mornings better. Thank goodness for that. 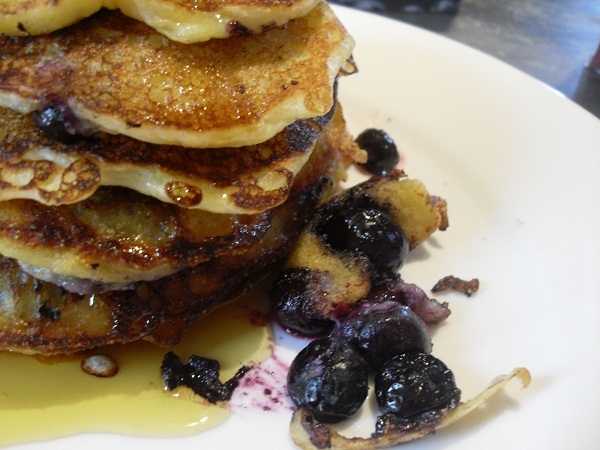 I love the cornmeal in these pancakes especially with the blueberries; someday your daughter will too. Raising kids is the hardest job on the planet and I did it for years. I had a lot of challenges but food was not one of them. They would eat anything. Your daughter is just expressing her independence. Has nothing to do with the blueberries or where they are located. Hell, these look good. My daughter is a pancake fanatic, so I'm going to get her to make these. Sneaky, hey? Lovely post.